Discussion in 'WildStar Fan Creations' started by Fluffyness, Jun 19, 2015. You're in luck cupcake! Let me whip up 3 steaming boxes of pure #@&!ing awesome! I'm giving away 3 signed box copies over 3 days, June 23, 24, 25! 2.I'll throw out an event tweet, RETWEET WITH YOUR TWITCH USERNAME. 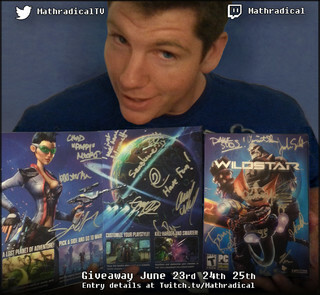 3.Be on stream June 23, 24, 25 4pm-7pm PST for the give away! If you can't make the stream hours just send me a message and I'll be sure you're accounted for. Time zones or RL stuffs shouldn't prevent you from entering this sweet give away. If you have any other questions boop me on twitter, I'll actually see it there. Hey guys the retweet sign up is out! Make sure to include your twitch username in the retweet and check this out for all entry details. First autographed copy went to Teksmith, grats! Join me tomorrow for a shot at the second box!